In addition, the number of employers who offer health insurance has declined and costs for employer-paid health insurance are rising: from 2001 to 2007, premiums for family coverage increased 78%, while wages rose 19% and prices rose 17%, according to the Medicare or the Federal Employees Health Benefits Program Standard Option. One indicator of the consequences of Americans' inconsistent health care coverage is a study in Health Affairs that concluded that half of personal bankruptcys involved medical bills, although other sources dispute this. 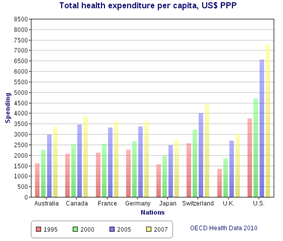 There is significant debate regarding the quality of the U.S. healthcare system relative to those of other countries. managed care have also been criticized by this same group. 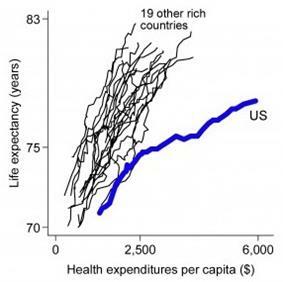 ^ Capital: In health care, consumer theory falls flat David Wessel, Wall Street Journal, September 7, 2006. ^ Harvard/Harris poll: Robert J. Blendon et al., "Views on health care: Public opinion in three nations," Health Affairs, Spring 1989;8(1) 149–57. ^ Los Angeles Times/Bloomberg: President Bush, Health Care, The Economy. October 25, 2007. ^ Rasmussen Reports: Rasmussen Reports. January 1, 2010. Retrieved November 20, 2011. ^ Rasmussen Reports: Rasmussen Reports. Retrieved December 30, 2012. ^ Primer on PPACA's New Fees and Taxes. Cigna. ^ Kuraitis V. (2010). Pilots, Demonstrations & Innovation in the PPACA Healthcare Reform Legislation. e-CareManagement.com. ^ PPACA Emphasizes Use of Health Information Technology. Foley & Lardner LLP. ^ PolitiFact: Barack Obama says preventive care 'saves money'. February 10, 2012. ^  Politico (20 Dec 2014). Accessed 20 May 2015. A key project is one that could radically change the way the medical profession is paid for services under Medicare and Medicaid. The current system, which is also the prime system used by medical insurers is known as fee-for-service because the medical practitioner is paid only for the performance of medical procedures which, it is argued means that doctors have a financial incentive to do more tests (which generates more income) which may not be in the patients' best long-term interest. The current system encourages medical interventions such as surgeries and prescribed medicines (all of which carry some risk for the patient but increase revenues for the medical care industry) and does not reward other activities such as encouraging behavioral changes such as modifying dietary habits and quitting smoking, or follow-ups regarding prescribed regimes which could have better outcomes for the patient at a lower cost. The current fee-for-service system also rewards bad hospitals for bad service. Some have noted that the best hospitals have fewer re-admission rates than others, which benefits patients, but some of the worst hospitals have high re-admission rates which is bad for patients but is perversely rewarded under the fee-for-service system. In addition, the law explores some programs intended to increase incentives to provide quality and collaborative care, such as Center for Medicare and Medicaid Innovation was created to fund pilot programs which may reduce costs; the experiments cover nearly every idea healthcare experts advocate, except malpractice/tort reform. 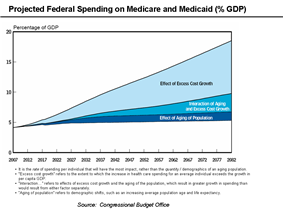 The law also requires for reduced Medicare reimbursements for hospitals with excess readmissions and eventually ties physician Medicare reimbursements to quality of care metrics. A 2001 article in the  Politifact rated a statement by Michael Moore "false" when he stated that "[t]he majority actually want single-payer health care." According to Politifact, responses on these polls largely depend on the wording. For example, people respond more favorably when they are asked if they want a system "like Medicare".